Home / Stock Picks / Stocks to Buy / Advanced Micro Devices, Inc. Breaks Out – Is It Time To Buy? Advanced Micro Devices, Inc. Breaks Out – Is It Time To Buy? 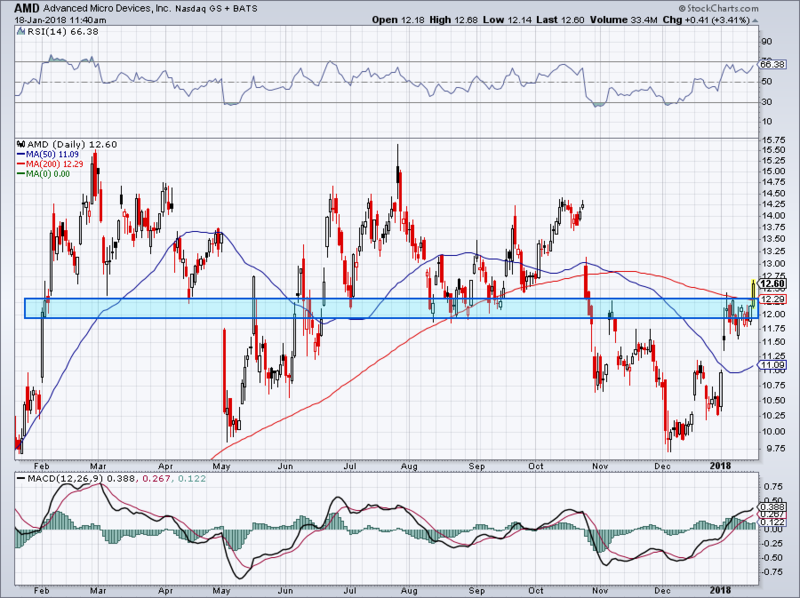 Advanced Micro Devices, Inc. (NASDAQ:AMD) was a beast in 2016 and in hibernation for 2017. It’s left many investors wondering what to expect from the chipmaker in 2018, given that many have seemed to temper their expectations. Well, AMD stock isn’t disappointing, getting off to a fast start and already up a robust 22% this year. Some investors might make a case for owning Nvidia Corporation (NASDAQ:NVDA) instead. Despite trading with a very lofty valuation, Nvidia is at the forefront of technological breakthroughs and high-growth end markets. It’s hard not to like Nvidia. But that doesn’t mean we should ignore the AMD stock price. Shares were jumping on January 18, following a mixed-message from the analysts at Susquehanna. Analyst Christopher Rolland makes the case that graphics processing unit (GPU) sales for ethereum mining were likely strong in the fourth quarter and in the first few weeks of 2018. That’s due to the profitability of crypto-mining, thanks to the big rally in digital currencies through December. However, therein lies the negative too. While short-term sales are likely gaining for AMD and NVDA, Rolland argues that this can lead to “false sales.” This will hurt AMD more than NVDA, he says, thus cutting his price target to $13 from $15. Of course, the market isn’t reacting that way, bidding up shares by roughly 3% on optimism of near-term and recent sales. Despite the short-term bump, that’s not what got AMD stock moving higher in the first place. Instead, it was a problem with Intel Corporation (NASDAQ:INTC). The company’s chips were susceptible to Spectre and Meltdown vulnerabilities. Unfortunately, Intel has a huge number of chips in everyday products. Mega-capitalization companies like Microsoft Corporation (NASDAQ:MSFT), Alphabet Inc (NASDAQ:GOOGL, NASDAQ:GOOG) and Amazon.com, Inc. (NASDAQ:AMZN) had to release patches. Its impact trickled to every product from Apple Inc. (NASDAQ:AAPL) too. So why did this give a boost to AMD? The rhetoric behind the move was that, with INTC being cast in negative light, this could be an opportunity for AMD to take market share. Whether it pans out that way or not remains to be seen. Regardless, this event ignited Advanced Micro stock out of the doldrums and into bullish form. After consolidating, shares are finally looking to breakout — we’ll get to that in a minute. Now investors can thank cryptocurrency miners for buying GPUs to mine digital coins. While those sales are far from make-or-break for AMD’s overall business, this inflated demand is not something that investors had been looking for until recently. Although the bitcoin plunge feels violent — and it is — remember that at $10,000, it’s up roughly 10-fold from January 2017. So there’s still plenty of demand to mine cryptocurrencies. And that’s good news for AMD and Nvidia. The move higher on January 18 is more than just a 3% rally. It’s sparking AMD stock out of a tight consolidation pattern and through a wave of resistance. The blue rectangle on the chart was a level that Advanced Micro stock could have easily failed at. Instead, it pushed through and is now above its 200-day moving average. I was hoping for a pullback into the low-$11s, but I find this move quite bullish. So what now? I hate chasing stocks. 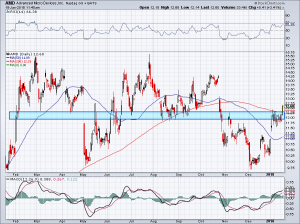 But the move in AMD stock is quite bullish and as I’ve outlined in the past, I like its business. On a sales basis, it’s the cheapest of the big three chip stocks (INTC, AMD and NVDA). Furthermore, the company is starting to turn a profit and is growing sales and margins. Cash flow is moving in the right direction as well. While Nvidia is the cream of the crop, it also comes with a lofty valuation and already carries a market cap near $135 billion. With AMD, a move back to $15 still seem reasonable given the secular nature of its industry. A move to this level would mark a return of 20%. 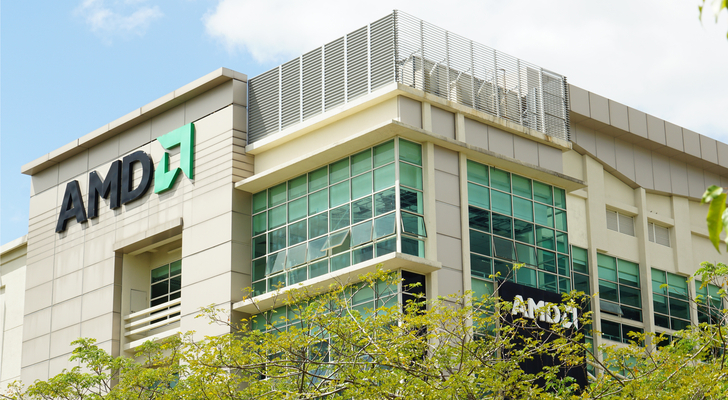 Article printed from InvestorPlace Media, https://investorplace.com/2018/01/advanced-micro-devices-inc-amd-stock-breaks-out-time-to-buy/.